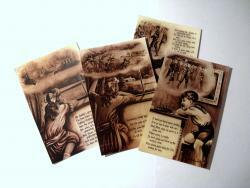 Replicas of a set of 4 different sepia-coloured, early-war period original postcards. Rather mawkish sentiments - "My Daddy's gone to fight..." etc, but very typical of 1914. Sepia. Blank reverses.